Contestant Ken works on his sketch. 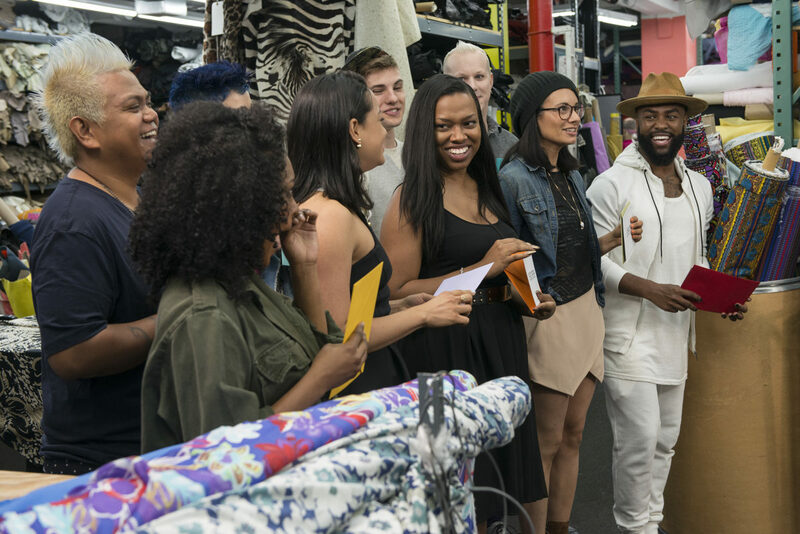 The episode opened with the contestants being summoned to Mood Designer Fabrics in Manhattan’s Garment District before even knowing the challenge details. Once gathered at their fabric shopping haunt, the designers were told by host Alyssa Milano that, due to questionable fabric choices in the past, the fabrics would be chosen for them in this challenge. Their concerned expressions gave away how they felt, and contestant Layana made it clearer when she explained that fabric choice can make or break a garment. For the challenge, designers were asked to create “high-end evening resort wear.” Alyssa was not done with the surprises, though: She called on Ken to pick an envelope, which contained the name of the fabric he was to use. Since he was last week’s winner, Ken also got to hand the other contestants their envelopes. Designers quickly selected options at Mood from their assigned fabric. It was on to the workroom, where the contestants were greeted again by Alyssa. They knew that could mean only one thing: There was twist to the challenge. Alyssa told all the designers to switch fabrics. Annoyed, everyone got to work. Dom seriously impressed the judges with the textile she made by hand for her skirt. Disappointed that she had to switch her jersey knit for linen, she decided to make her design as light as possible. She melded yellow and blue fabrics to make striped yardage. The resulting skirt was interesting. It reminded me of a beach towel, but in a fun way. It was a successful design. 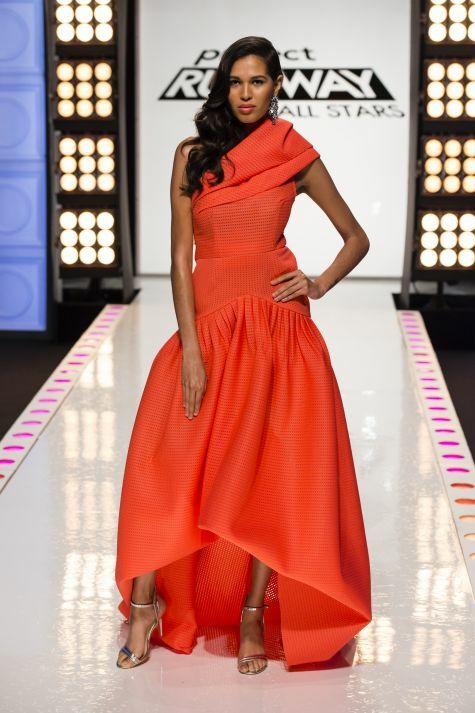 Valerie’s design was simple and sweet, but apparently too much so for the judges. She originally was assigned linen, but in the switch picked up lightweight cotton. I liked this jumpsuit and thought it was one of the only looks I could envision a woman wearing as resort wear. As mentor Zanna Roberts Rassi noted, the competition has gotten to the point where “good” designs go home. Unfortunately, that is what happened here. I have always liked Valerie, so I am sad to see her go. Sam was assigned lace in the beginning but ended up with brocade. Despite having such a heavy fabric for resort wear, he did well. He was lucky that Kini had chosen an excellent textile. One judge complained that the fabric made the dress, and without it, the design would not be anything special. It was not the first time Sam heard this criticism. He needs to stop relying so heavily on the fabric and focus on the design itself. Ken has been wowing me lately, and this dress in no exception. He didn’t like his originally assigned silk charmeuse, so the switch to neoprene was welcome and appears to be exactly what he needed. Ken normally avoids bright fabrics, but I think he should use them more. This dress’s silhouette is great. I cannot wait to see what Ken spins out in the coming weeks. Layana got stuck with a matronly fabric, and it was a disservice to her. She traded down her fabrics: Originally given lightweight cotton, Layana was forced to choose Ken’s silk charmeuse. 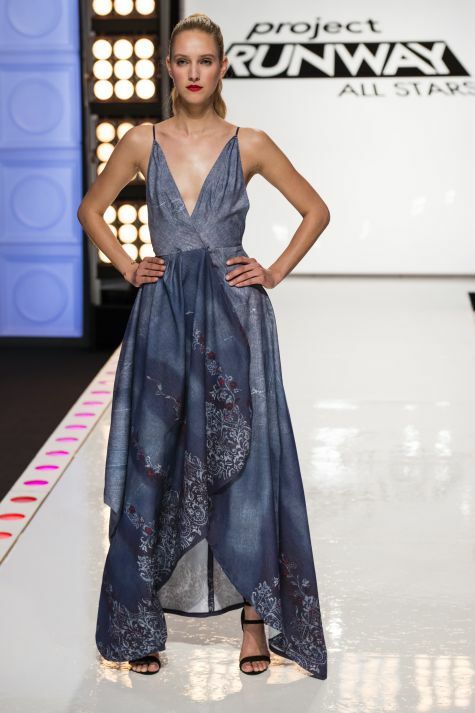 The jumpsuit she made was not right for this fabric, and judges criticized the garment’s length. Judge Isaac Mizrahi pointed out that a pair of flats may have served the dress better than the high heels she chose. Emily has failed to make anything incredible lately, and this outfit serves as an example. She had the extra-challenging, sheer polka-dot fabric, but she could have utilized it in a better way. She created something interesting with the upholstery fabric, but in what way is the design high-end? The ensemble was too much all at once, and, honestly, it wasn’t worthy of staying another week. Emily struggled with the challenge but seemed satisfied with the result, and I believe that spoke volumes to the judges. Kini created something that was not high-end, but he was stuck with Sam’s fabric choice. Kini also had little choice in creating the skimpy design because Sam had gotten only 3 yards of the cheap-looking lace. Kini said that seeing the amount of fabric and the color scheme Sam chose in this challenge led him to question Sam’s skill as a designer. I think Kini did well with what he was given. Asha created something beautiful with jersey, and I’m sad to see her not among the top contestants for this challenge. However, I’m glad she is safe because I am impressed with what she has been turning out lately and can’t wait to see what else she does. Alexander did wonderfully with the denim he had to work with. 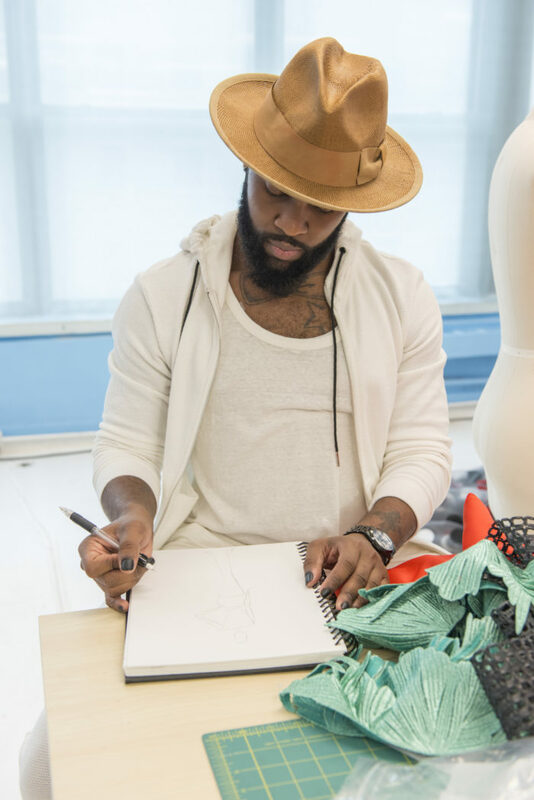 I was nervous for him when he chose it over the lace or brocade because I figured denim would be the hardest fabric with which to design evening resort wear. He created a great dress. The judges couldn’t criticize: This was a case in which the contestant’s design won higher marks than the fabric. The look is very high-end. Alexander did an outstanding job. Do you agree with Valerie leaving the competition, or do you feel the judges should have voted someone else out? Leave us a comment below to let us know, and don’t forget to tune into Project Runway All Stars at 9/8 central timeevery Thursday on Lifetime. Judge Isaac Mizrahi, guest judge Megan Hilty, judge Georgina Chapman and host Alyssa Milano. The remaining contestants are assigned their fabrics at Mood Designer Fabrics. 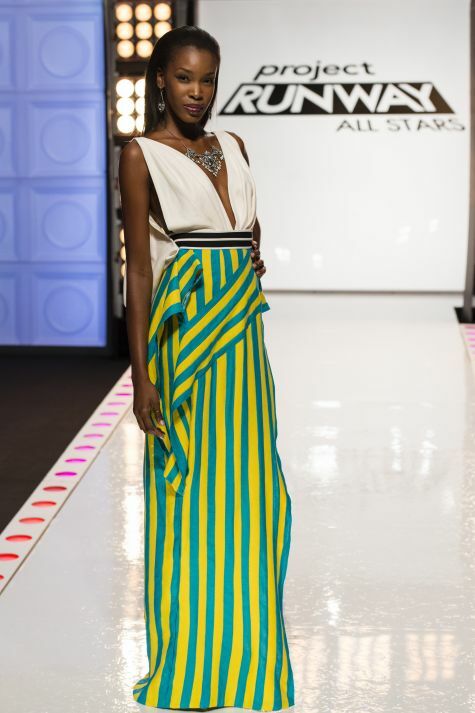 Project Runway All Stars: Season 5, Episode 11 - "State of the Art"
Project Runway All Stars: Season 5, Episode 4 - "Fashion 911"
I am a magazine subscriber of THREADS. I have tried repeatedly to become an INSIDER. I read each time that I have the wrong password.